Doodles in South West England is a perfect choice for a great holiday or a fun short break in Cornwall. Find out more about Doodles below. Within a short drive of five all-year dog friendly beaches and less than a mile by country lane from Caerhays Castle and the south facing sandy cove at Porthluney, this attractive semi-detached stone cottage enjoys tranquil countryside views from every window.Â Set in a small row of pretty character cottages built in the early 1900â€™s as part of the Caerhays Estate, Doodles offers spacious family accommodation in the peaceful hamlet of Tregavarras. Gorran, just under 2 miles by road, has a church, village store/P.O. and pub featured in TVâ€™s Wycliffe and the un-commercialised small beaches at Porthluney, Hemmick and Vault are less than a 10 minute drive.Â The attractive sandy beach at Gorran Haven is 3 miles, Mevagissey has a selection of shops, pubs, restaurants and boat trips from the harbour about 4 miles away and for a wider selection of amenities the town of St Austell is 9 miles.Â There are local walks leading to the village of Gorran and the South West Coast Path at Porthluney beach and for garden lovers, Caerhays Castle, famed for its Camellias, the Lost Gardens of Heligan (2 miles) and the Eden Project are all within easy reach. We have the following details listed regarding Doodles accommodation accessibility but we would recommend that you always confirm these prior to booking with the owner or operator. Doodles is a great base to explore the wonders of Cornwall and you will find plenty of activities near by. Doodles is at Gorran, Cornwall. Check out the map below for directions, use the controls to zoom in. "Excellent, very comfortable accommodation & very dog friendly." "Wonderful cottage to spend our honeymoon in!" "A comfortable and stylish property in a beautiful rural location and only minutes from a great beach..."
"Was peaceful and relaxing. I'm fussy but this cottage was traditional with nice touches. Felt very comfortable..."
If you have stayed at Doodles why not add your thoughts, comments, pictures to our Facebook page? Don't forget to add the name/town/page link to your comment so its attributed to the correct place. Please keep it polite, we are sensitive souls! Find Cottage Holidays works closely with independent cottage owners and leading holiday travel operators to provide you the widest choice of self catering accommodation across England. Doodles in Cornwall is available through: Cornish Cottages. With almost 50 years' experience, Cornish Traditional Cottages are the most established holiday letting agency in Cornwall. 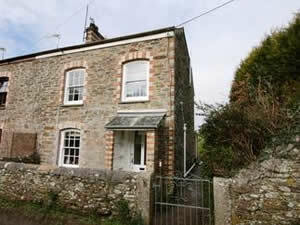 They let all types of homes to holiday makers for owners throughout Cornwall.